A true medicinal food used for centuries, vanilla is a ‘superfood’ that is especially powerfull at enhancing brain and mood health! 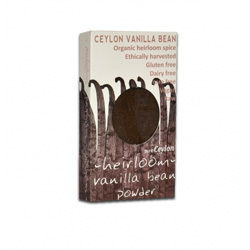 Ceylon Vanilla beans have grown naturally in the spice gardens of Ceylon from ancient times. Our Vanilla blooms are hand pollinated and left to mature for 8 months into beans on their own vines. Carefully handpicked, the beans are further cured naturally to enhance the aroma and flavour before being ground into our exotic vanilla bean powder. A super cognitive food, it is a powerful mood enhancer and helps control and maintain healthy levels of inflammation!